Who has already tasted deblas? 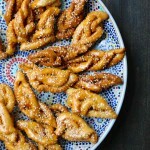 These delicious Tunisian pastries coated with honey syrup are addictive! Once you start eating them, you just can not stop! 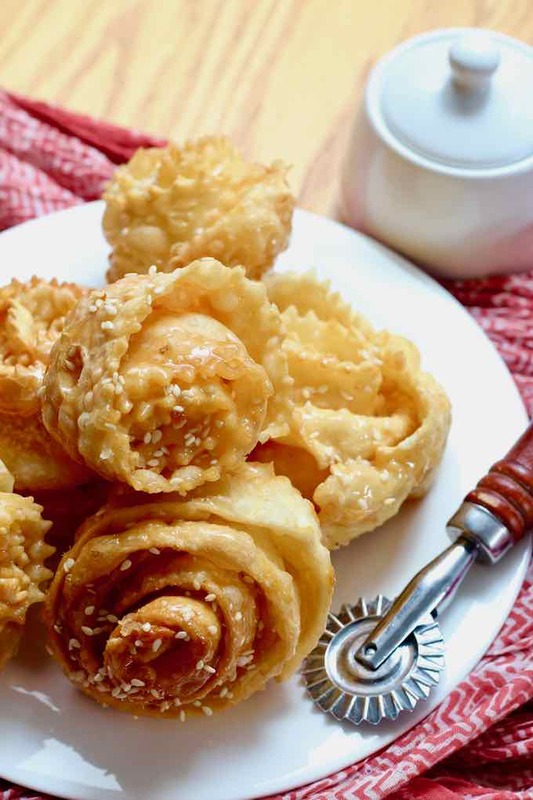 Light, crispy and deliciously coated with syrup, the deblas are almost always present on Tunisian tables at the time of dessert and are also served at tea time, along with a glass of mint tea. Deblas are also an essential part of the Tunisian pastry repertoire, just like samsas, graibas dro, graibas homs, yoyos and zlabias. What is a Tunisian debla? Debla, eddebla (“alliance”), oudhnine el kadhi (“ears of the judge”) or manicotti is a Tunisian pastry made with simple ingredients, including flour, eggs and water. 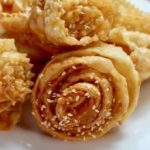 It is a crispy pastry that is deep fried before being coated with an orange blossom water scented syrup, and sprinkled with sesame seeds or crushed nuts. 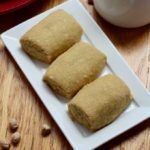 Traditionally, two or three women would gather for the preparation of these pastries that can be time consuming to prepare in large quantities for the whole family. In some northern Tunisia cities, it is customary to use a half eggshell as a measurement to make this debla recipe. The water added to the dough, as well as the yeast, are measured using this half eggshell. It is certainly not very precise! Add to that “handfuls” of flour and “glasses” of water! 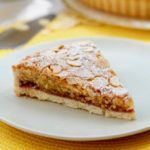 The grandmothers of yesteryear were certainly using their years of experience in pastry making instead of following recipes to the letter! In my opinion, the are really two important tricks to prepare deblas! The first difficulty lies in the rolling of the dough into very thin strips. The second one is the frying stage. 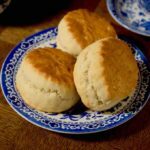 Even with a lot of elbow grease, it is extremely difficult to obtain an ultra thin dough just by rolling it with a rolling pin. A pasta maker will be your precious ally when making these pastries and it will save you precious time! You can also use the pasta roller attachment of your stand mixer to roll the dough into thin strips. It will make it easier to wrap the strips around the fork at frying time. The strips of dough should be as thin as possible. Traditional deblas are light and have tiny bubbles on their surface. Their texture is crispy and brittle. If you get a rubbery and heavy end result, it’s because you have not rolled the dough thin enough! Now let’s move on to serious things: the frying stage! 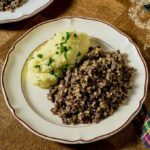 You will need to wrap the thin strips of dough around a fork into the hot oil while gently pressing along the edge of the pan. The strips should be wide (about 2 inches) and long (around 10 inches). In some regions of Tunisia (Djerba in particular), the strips of dough are cut with a serrated dough cutter for aesthetic reasons. Of course, this complicates even more the frying stage because it becomes more difficult to obtain very regular deblas. It could sometimes happen that the strip of dough escapes and the “rose” opens up while frying. If this happens, do not panic! This step requires a little practice but you should get the hang of it rather quickly! Last but not least, make sure the oil is not too hot when frying the deblas. They must be golden brown but not dark brown. If you follow all these tips, you will get perfect deblas! The deblas have cousins ​​and variants around the world. Donuts and other fried pastries are popular throughout the Maghreb. In Morocco, the deblas are called fazuelos. People call them fijuelas in the Spanish zone of Morocco. 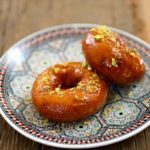 There is another kind of pastry made with fried dough that is dipped in honey syrup: Moroccan chebakkia, that are colored and scented with saffron. In Algeria, the same pastry is called griwech (or griouech). In the south of Spain and Andalusia, the pestiños come closest to the deblas. The pestiños are crunchy donuts that are fried in olive oil then coated with honey or icing sugar. In Málaga, these fried pastrues take the name of borrachuelos. In Poland, people eat the chruściki, also called angel wings in the United States. These crispy donuts do not have the shape of roses but their texture is comparable to that of Tunisian deblas. 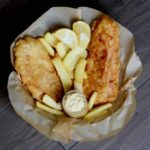 On Mardi Gras, it is traditional to eat bugnes in France. It is the bugnes from Lyon that are crispy and covered with icing sugar, that are the closest to the deblas. 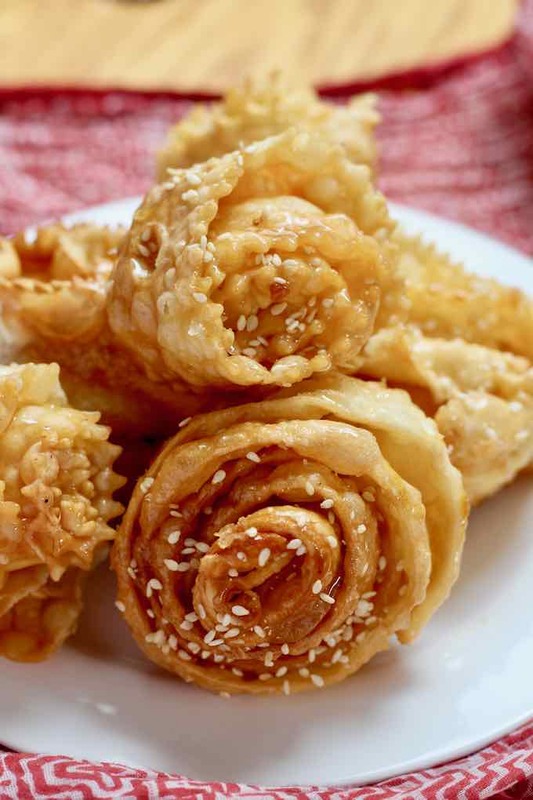 There are a few pastries that are also presented or called with names like roses or ears, just like the “ears of the judge” (ouedhnine el kadhi) in Tunisian. During the Jewish holidays of Purim. 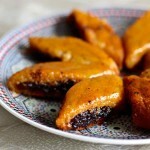 for example, it is customary to enjoy oznei Aman (ears of Aman) aka hamantashen (in Yiddish) in Ashkenazi communities. 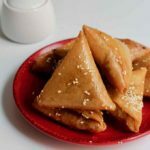 These pastries have a relationship with the deblas only by their name, as they are shaped as a triangle of shortcrust pastry filled with jam or poppy seeds. In Brazil, people enjoy the orelha of gato (cat ears). 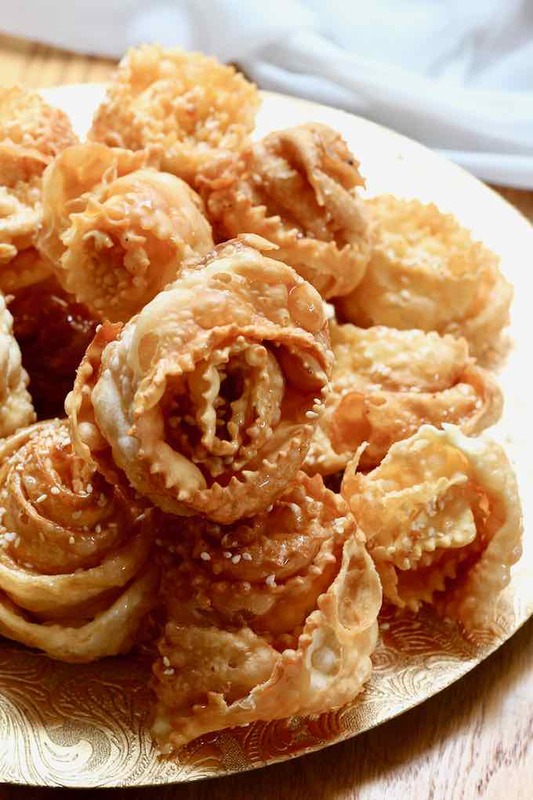 These fried pastries actually look like French bugnes. This recipe is validated by our expert in Tunisian cuisine, Chef Mounir Arem. Chef Mounir is the chef-owner of the restaurant Le Baroque in Tunis. Debla (or Ouedhnine el Kadhi) is a Tunisian pastry which consists of a thin strip of dough that is fried before being coated with an orange blossom water scented syrup, and sprinkled with sesame seeds or crushed nuts. Mix the flour, water, eggs, oil, lemon juice, orange or rose blossom water, and salt and knead until obtaining a smooth and homogeneous dough. If the dough is sticky, add a little flour and if, on the contrary, it is hard, add a little water (or orange blossom water or rose water). Divide the dough into 3 pieces of equal size. Cover each piece with plastic wrap and let them rest for 45 minutes in a cool place (not in the fridge). This stage allows the dough to become less elastic so it will be easier to roll. Sprinkle the work surface with cornstarch and, using a rolling pin, roll the first dough to about 1/16 inch thickness. Using a serrated cutter, cut strips of dough, about 2 inches wide and 10 inches long. Repeat the operation with the remaining 3 pieces of dough. 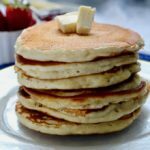 Place the strips of dough as you make them, on a dry cloth sprinkled with cornstarch and cover them so that they do not dry. Take a strip of dough and shake it gently to get rid of the cornstarch. Heat a large pot with vegetable oil over medium heat. Using a fork, prick the end of the dough strip while holding the other end with the other hand. Dip the part held by the fork for a few seconds in the oil then roll the dough quickly around the fork. Carefully remove the fork, and flip with a slotted spoon. When it is golden brown, take the strip out of the oil and place in a colander. In an non-stick saucepan, combine the honey, lemon juice, orange blossom water (or rose water) and bring to a boil. Turn off the heat and soak the ouedhnine el kadhi (still hot) in the hot syrup. 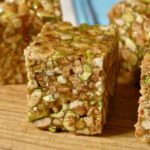 Sprinkle with sesame seeds or ground pistachios. It is possible and even preferable to use a pasta roller (pasta machine) to roll the dough. 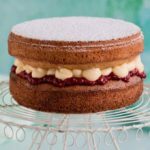 As the founder of pastry food blog Les Trois Madeleines, Sarah-Eden reinvents glamorous desserts with original pastries. She enjoys discovering new blogs, interacting with food bloggers, and of course, she loves madeleines!